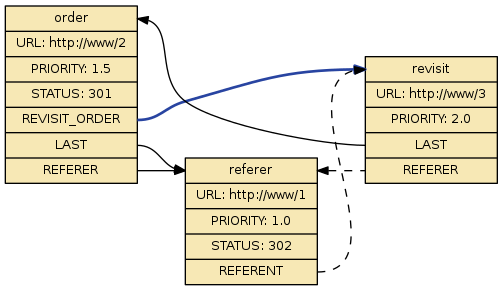 The HTTPClient implementation and ContentFetcher filter returns the redirect status and Location header (does not follow). A RedirectHandler filter resolves the redirect Location, and applies it to a new REVISIT_ORDER cloned from order. A Revisitor filter adds REVISIT_ORDER back into the VisitQueue. This approach offers fine-grain filter-based control of the entire redirect process, including the opportunity for early termination. In addition, it gives the VisitQueue and VisitManager exclusive control over host politeness constraints. The sections below give the processing sequence with UniMap order states. 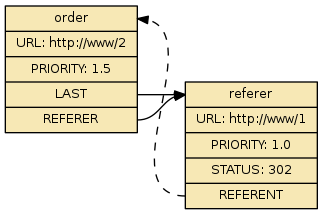 Note that PRIORITY is also increased by a fixed per-redirect value (configurable, 0.5 default), representing the value of work conducted thus far and prioritizing the redirect over existing queued work. 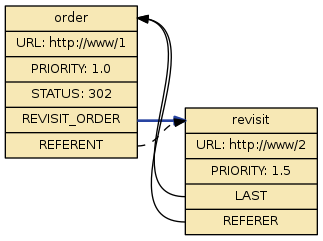 The Revisitor then removes REVISIT_ORDER, submits it to the VisitQueue (VisitCounter interface, via VisitManager), and terminates the current filter chain. 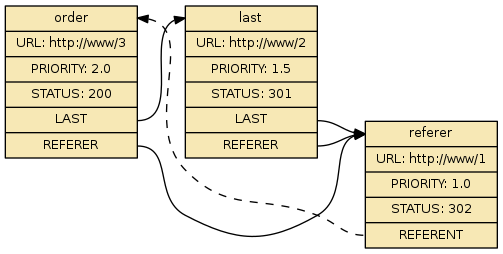 The redirect path can be walked in reverse order by following LAST references. REFERER always points to the beginning (first redirect) of the series. REFERENT always points to the end of the series.